Vandaag het gesprek met Val Geisler. Val Geisler is ridiculously obsessed with email. 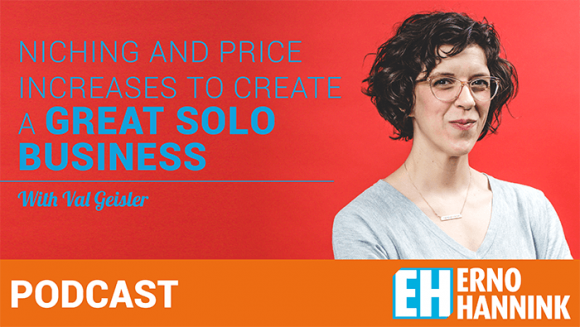 An Email Marketing Conversion Copywriter and Strategist, Val spent over a decade on the inside of companies from non-profits to 7-figure businesses to tech startups. She brings her background in content creation, customer experience, and digital strategy to her incredible clients every day. Email isn’t dead, and Val is here to help you bring yours back to life. The last six years she’s spent deep in the world of customer experience and research. Val built the content and email marketing for a fast-growing startup, wrote around the Internet about what makes for good email. She is an introvert who loves figuring out how people think. Val started her business in 2011. She started as a virtual assistant, a generalist. The goal was to simply replace her salary. Which she did, but she also learned about the other expenses, taxes for a business owner. Slowly she shifted more towards project management where she contracted other specialists. That’s where she learned to focus more and more on customer experience – niching. Then she was offered a full time position at ConvertKit. So she paused her own business. After 1,5 years she was ready to restart her business but now with the focus on email in this niche of companies that use monthly recurring revenue for their business. By talking about the development of her business it becomes clear that once she makes a choice for the direction of her business she is clear what to say no to. By saying no to more and more leads that came to her from experience of the past, she was able to create her own blue ocean. She increased the pricing slowly but steadily. Her full day rate is now almost at $ 3.000 and she is booked out for 2-3 months for projects. Enjoy the insights with Val. Today I have another conversation with a solopreneur Freelancer that has created at a very specific niche for herself. And in this way, she’s able to make the money that she’s looking for. And that it was she came onto my path because of Joel Kletke that have also interviewed in the previous podcast, I will put the episode Lincoln with the show notes and Val is another person that was on my list that I said, Well, I think it is really great to talk to her because she has is really great niche and and, and the way that she charges is also very interesting. Welcome to the show, though. Val: Well, thanks for having me. I know it feels easy to connect with you, you in your writing. Val: Oh, thank you. I aim to be helpful, but also not beat around the bush. So I like to, I don’t want to waste anyone’s time. So I get straight to the point as much as possible. But I also try to do some teaching around that. So that’s the that’s the main way that I like to write. And to me, it’s all about delivering value, and you can’t deliver value if you aren’t helping people. And if you aren’t telling them the truth, then that’s not very helpful. Erno: Hmm. And, and because I’ve listened to have listened to I’ve written he’s now right. I’ve been reading your profiles, for example, on on LinkedIn. And they are you saying that you work in general for what you call brand? Val: I’m in our focus brands. Yeah, so monthly recurring revenue, Mr. Yeah, so typically, that looks like software companies. And sometimes it’s e commerce if they have a subscription service, but those are the main companies that I work with, is people who are really focused on on what that monthly recurring revenue is, and, and the impact that that has on their business. great so I I am a member of the form of superfast business that is a James Franco ease in Australia, and he’s doing coaching and he has a membership as well. But it’s not it’s not it’s it’s a yearly fee that you pay does it does that fall into the, in your workers, or is that just not included. from a communication standpoint, and not just a product standpoint. in another business, you know, that area, you were at the state and event manager in several companies, how does this relate to what you’re doing today? Val: my friend Natalie calls it a spiral staircase, you know, we’re not on this corporate ladder, necessarily, where it’s this one, one straight line, but a spiral staircase, where they, you’re still going up and, you know, progressing. But the view might look a little bit different, each couple of steps. And, and that’s certainly been true for me, I mean, I, you know, I, I did go to school for theatre production, and I worked in theatre and special events when I graduated. And, and a lot of that work still does apply today. I mean, ultimately, theatre and special events is about humans, and connection, and creating something really special and walking people through a journey together. And, and all of that goes into the work that I do today, I today, I do it sitting behind a computer and through email, but that that experience that overall customer journey or you know, in the case of an event or theater production, that the journey the audience goes on, it’s all still there. And that that’s the piece that carries through in every kind of work that I’ve ever done. Erno: So in the theater, you’re in direct, you’re on the stage, you’re in the center. the common like an introvert because you’re, you’re just behind your website or your screen? still focused on people. But I, I get to do it from a little bit more of a quiet place, and, and not surrounded by, by people in theater unnecessarily anymore. Erno: Yeah, I understand. So battling the financial issues, because you had to learn about all the extra cost you had. And it was not just about replacing the cell, you had to have more money, make more money so that you can cover on your cost. specialized in certain areas of, you know, the things that I was doing as, as more of a generalist, they they did that and that alone, and I worked with them, I hired them as, as contractors, for me to help manage this huge workload I had built up and, and that’s when I started to think about specialization and the impact it would have on on my business. How long did it take you to implement this when you saw it, and then you figure out you have to do this. writing on my blog a lot. And I had started using an email marketing tool, and I pitched them about working with them on their customer experience as well. I had never had a customer who was a software company, and they were a small growing startup and with some need of better customer onboarding., I pitched them to work on their customer onboarding. And, and they said that they wanted to hire me to write the blog and manage their, their blog content. And so I ended up working there full time I, I left my business, you know, I wrapped up things with my existing clients and, and figured I’d try this in house role for a little bit and work there for a year and a half and learned a lot about email and the way that it related to the customer journey and overall customer experience. I learned about software companies, and met a lot of people in that industry. And the the future of what my business would become was kind of shaping itself without me realizing. Erno: and in the meantime, did did you said you just stopped your business for a while? But did you just also stop the website and everything, just everything? Okay. changing my audience number of times, in the in, in, in my career as a as a business owner. And I find it very difficult for people to understand what I do, because they’ve seen a number of times me changing my topic or my niche. how did you work with that? that I’m, I’m very comfortable saying, No, I don’t do that anymore. And a lot of times, people are referencing something I did you know, at this point. Now, I’ve been focused on email for a year and a half. And that’s not going anywhere for me. So if someone’s referencing, oh, Val knows everything about systems, well, that’s from when I systems and tools of, you know, various needs for small businesses. That’s from when I was running a virtual assistant business five years ago. So I’m like, that person obviously hasn’t done any research into what I’m doing now, before, they just recommended me to someone. So I don’t I take those things with a grain of salt. If you if you go to my website, Val guys.com, it’s pretty clear exactly what I do now. So yeah, I don’t worry about that too much. Erno: And is I read your post from I think it was 2016 where you had to you have Hell no, it all lines up. Val: Yeah, yeah, I, you, you do have to get comfortable saying no, as a business owner. And, and in lots of different ways, you need to say no, to clients that aren’t a good fit, you need to say no to opportunities that are taking up time that you don’t want to spend that way, you need to say no to friends who want to have lunch in the middle of the day, because they think that you don’t do anything all day long. There’s lots of things you need to say no to. And the more practice you can get, you know, do it in small ways. So that it when it’s the big ones it and it really counts, it’s easier to do. Erno: So when you when you’ve decided that you were going back on your own and you focus on email right away in the from the beginning, did you did you say okay, no, to all the old business or did you just get something going so that you at least made some money. learned about someone named Philip Morgan, who I credit entirely to my knowledge of specialization, because Philip has this wonderful email list, it’s a daily email that you get about specialization, and I, I joined his list and implemented what he said every day a little bit, you know, it’s like a little tiny step every single day. And over time, I realized that, you know, where I need to be, is focused on this, this space of email marketing and customer experience, through email, and, and specifically for monthly recurring revenue businesses. And it goes even further in that I like to work on life cycle emails, so onboarding, retention, reactivation and webinars, those kinds of campaigns, I don’t, I don’t like writing the one off emails, or the weekly newsletter updates, those aren’t for me, I like the campaigns where you can really see people move through an entire customer journey on that campaign. And that’s, that’s the kind of work that I do best. And so that’s basically all I do now. Erno: That’s great. And I have written anything down from Phillip Morgan’s, I will put the link in the show notes, because I think there was an important tip that you gave there. we say, all the time in the yoga studio, that if there’s a word here that you don’t like that, that doesn’t speak to you, if, if a yoga teacher is talking about the universe, but you’re particularly religious, and so you can replace the word the universe with God, and then that, then it works for you, and being open enough to just making that tiny switch and something and so that it works for you then do it and I knew I could replace developer with marketer and it paid off in the long run. an opportunity or network for co working with other women. just creating the then based on the needs of the community. So if they need a Saturday afternoon event, where it’s just moms, and we can provide babies and the kids can all hang out together, and sometimes their speakers, sometimes it’s just for working on whatever you need to get done for the day. But yeah, it’s really evolving based on what the community needs. Erno: But I I maybe it was my mind, I thought about a co working space, but it’s not it’s not that. Val: Oh, yeah, it was at one point, but that that just didn’t, there’s a lot of red regulations and red tape with those kinds of things. So especially when kids are involved. So I know we moved away from that. Erno: Yeah, I I also read one of your posts think it was in your blog about that you stopped doing promotional posts? Val: Oh, yeah. I even for my business. Erno: Yeah. And you’ve placed it with a statement of work. I think that sounds very interesting to me. all of its right there, there’s no Oh, okay. Yes, accept the proposal, okay, here’s a contract. Except that, okay, I’ll send that back. That’s too many opportunities for them to change their mind, right. Whereas if the statement of work, they’re getting everything all together there, it’s right there, they can sign it, send it back. And it’s done that and the payment form of payment, and it all taken care of, there’s not a lot of back and forth. And I found that to be really, really successful in moving clients through the customer journey. Erno: In the previous podcast, I’ve been talking to Peter, and he uses another method that also been talking about with, with potential up with a number of entrepreneurs, he’s when he’s with the client talking about the, the, the, the project that they’re working on, and he’s doing training, coaching, he, he, he draws the whole process on the whiteboard or flip over, then he puts the wise down and whatever discussion comes up. And he pointed that the client has not sure they, they elaborate on that. And it’s a goal. So it also goes on the paper and any anti makes a photo and then he sends out a standard contract with the photo. And, and that’s it. So you don’t need to make proposals, long written proposals. And the client sees the photo. And again, again, and room discussion remembers the points that we talked about, and the price they actually have already agreed upon in the meeting. And I found that a really smart way of avoiding as a entrepreneur business owner to make to go back to your office and make a proposal and then send it to the customer. And even if you have like, the whole package together like a statement work, it is all written down. Now. It’s it is often it’s, it’s, it’s something different than they expected when they were talking to you. when I was doing more kind of generalized marketing stuff, I would sketch out a wireframe on a piece of paper and take a picture of that and send it to the to the client as opposed to then getting into some kind of wire framing tool or trying to turn it into something on my computer, I would just take a picture of that, or I have an app called Scannell that looks like it was scanned in, you know, so I can so it’s still on my phone in a essentially I’m taking a picture, but it makes it look like it was something scanned in and and I’ll send that and and it almost comes across better. Like, oh, yeah, you were really listening. You actually took the time to do this, there’s so many templates and pre done things out there on on different software’s that a client might think like, Oh, this is a template that was copied and pasted from someone else. But if you hand drew it, it’s clearly for you. So there is something to that, that hand drawn element. I like that idea of, you know, kind of just shooting over your notes and having that be attached to a contract. I like that. wanted today, especially with all the online communication going on, and having just more connection, it people are looking for that. then you’re not burning bridges. You’re not making anybody mad. You know, I do mind with respect. And again, going back to what we talked about at the beginning, sharing value. So I know that when I do that, I’m, I’m only building relationships and not tearing them down. So that’s, that’s why I do that is to show an initially I did them to show what I was capable of. And then in doing that, I gained new clients. And now I have this portfolio of real work. But I also have the tear downs that are like, yeah, you could, you could hire me and I could put that into place. And then some and and other companies get inspiration from them. So I’m happy to to, to know that they’re, they’re working, even if they aren’t working on the company that I wrote it about. Erno: Hmm, I agree. I did. I did a similar thing for quite some time. I think it’s like 50 videos and also tear downs and on how their funnel it’s working. But yeah, now the funnel is not my focus anymore. So I stopped doing those. And actually, I also take took them down from from YouTube and anything so that because it doesn’t support my work today, anyway. you know, I am still booked out, I’m booked through December now. I let’s say, take your hourly rate, and multiply it by the number of hours that you’re going to do. So let’s say you have $100 an hour rate. And so multiplying that by six makes it a $600 day rate? Well, the $600 for a day feel like that makes sense for you. And if you’re used to hourly work, it probably does. But I would challenge you to see what would happen if you double that. give them a heads up and and then also an encouragement for them to book with you. Right? Oh, well, I want to get in on their schedule before the prices go up. So let me let me get that booked and paid for. So it’s a great way to get some business in the books. Erno: I’ll let you go as soon can now.